Single port endo-laparoscopic surgery (SPES) has shown much enthusiasm as this procedure is perceived to create an advantage in terms of better cosmesis and less pain as compared to the standard laparoscopic procedures. Comparing SPES and standard TEP is achieved with the clinical outcomes stated below. 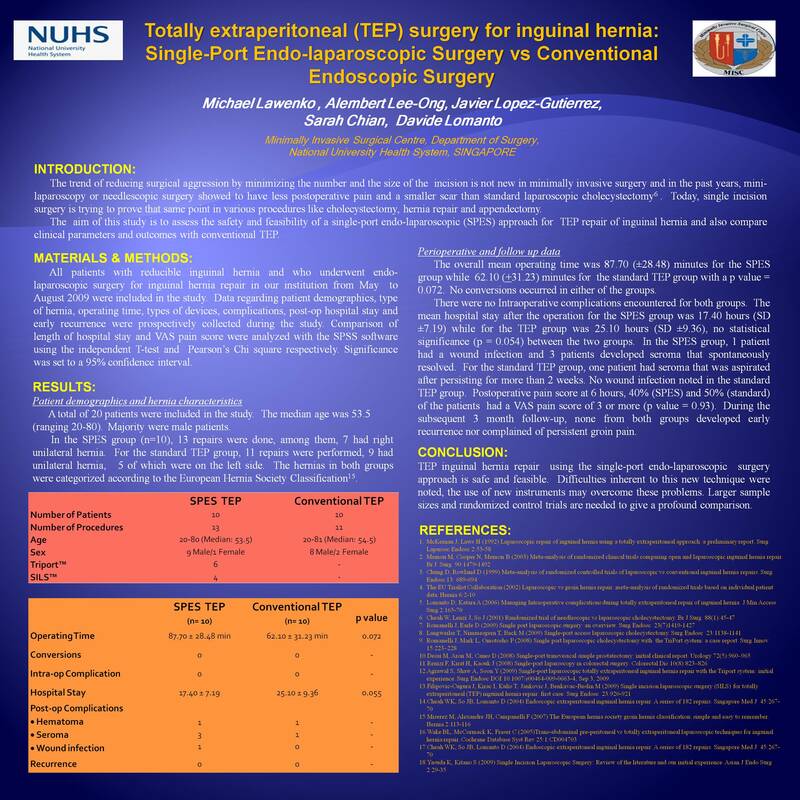 From May to August 2009, we prospectively compared 20 patients undergoing TEP hernia repair using the SPES technique (n=10) vs standard laparoscopic technique (n=10). Clinical outcomes like patient demographics, operating time, complications intra and post-operatively were recorded. Pain score upon discharge and length of hospital stay was measured. Statistical analysis using the independent T test and the Pearson’s Chi square was carried out using the SPSS software. Mean age was 51.35 (20-81 SD= 17.61) , 17 males and 3 females. SPES used 6 LESS™ port (Olympus, Japan) and 4 SILS™ port (Coviden, USA). Mean operating time was 87.70 (SD=28.48) minutes for the SPES group and 62.10 (SD=31.23) minutes in the standard TEP group with a p value of 0.072. No conversion to standard TEP was done in the SPES group. Both groups had no intra-operative complications. Three seromas and one wound infection in the SPES group which resolved conservatively. One hematoma and one a seroma for standard TEP. Forty percent and 50% of the patients had a VAS pain score of 3 upon discharge for the SPES and standard TEP group respectively (p value = 0.93). Mean post-op stay is 18.60 hours (SD= 6.18) for the SPES group while 25.10 hours (SD=9.36) for the other group (p value = 0.093). SPES is a longer operation with less hospital stay. The postoperative complications and pain scores are comparable. All the comparisons were statistically insignificant due to the small sample size, thus a larger sample population is recommended.